Vanaheim N42 USA is a 2017 release, 6-in-1 sleek and modern oilless air fryer with a 4.2-quart capacity, 130-watt power (AC 120V and 60Hz), a touchscreen digital LCD display panel and the high speed dynamic hot air circulation technology. It is rated 4.4 out of 5 stars by 31 customers and we’ll have a look at a few questions asked. With the 360-degree dynamic hot air circulation system the heat is evenly distributed throughout, keeping the exterior crisp and the interior tender of most ingredients. 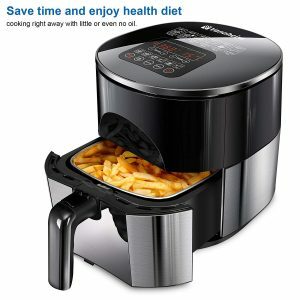 It is an FDA-certified fryer and there is no chemical coating on the interior or exterior. Everything is food grade 304 and the pan is free of PFOA. Both they fry basket and the fryer housing are made of 18/8 stainless steel. The Vanaheim N42 is a great quality, food-safe, AND multifunctional kitchen appliance. It has the variable temperature control and you can adjust the cooking temperature between 100 and 400 degrees quickly and easily via the display panel. And there are 6 pre-set programs for making different types of ingredients. There won’t be any oil, smell or mess on your kitchen bench during the cooking. You can use this compact unit as an air fryer, grill and an oven for baking and roasting. If you want to fry potatoes or other ingredients, you may do so with zero or very little oil. It will take you a maximum of 15 to 20 minutes to cook most meals. 4.2-quart capacity is large enough to prepare meals for a few people, making it good for both single people and families. It includes a removable food-grade, stainless steel basket that can be cleaned in the dishwasher. The handle is cool to touch and the button has a protective guard, so that there won’t be any accidents or injuries. You can make quick and healthy meals without needing any cooking skills. And this will work for people with busy work lives. They can make pizza, pies, fish, steak, chicken wings and tenders, tater tots, meatballs and more. You can fit in a small chicken easily. It is easy to clean with just a sponge and warm water. The air fryer comes with a user manual and a recipe book of more than 50 recipes. The Vanaheim USA Air Fryer has the security features like the auto shut-off, a button for basket demounting, a safeguard cover to stop de-mounting by accident, and a double-protection circuit malfunction detector. If you choose to use the preheat button you’ll make sure the temp gets to the level you need before cooking. There is a 99-minute integrated timer and with the automatic shut-off feature you can have a peace of mind. It will help you prepare breakfast, lunch and dinner easily. Vanaheim N42 offers healthy cooking options by not cooking with a lot of oil and you will save money on oil. It looks nice and modern- is easy on the eyes, works well and has user-friendly features, but costs less than many other competitive models. As it is compact in size it doesn’t occupy a lot of space and you can put it away after each use. 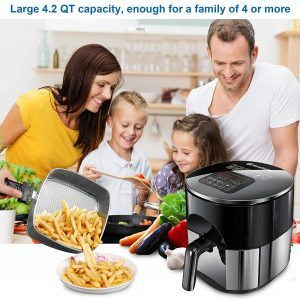 It is a good quality air fryer that is offered with a hundred percent satisfaction guarantee. And if you are not happy with the air fryer for whatever reason you may return it within 60 days without any questions asked. If you encounter any problems- if it stops working within the first 12 months you will be sent a brand new one by the company.